Schistura kottelati, new species, is described from the Hung Dang Valley (Phong Nha-Kẻ Bàng National Park) in central Vietnam. 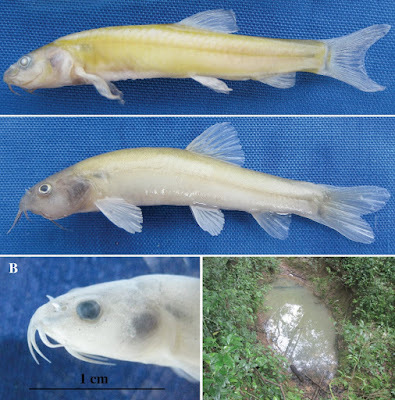 It is distinguished from all other species of Schistura known from Vietnam and adjacent areas in Laos by a unique combination of characters, including features of lateral line and body pigmentation, counts of fin rays, and barbel and body measurements. Diagnosis. Schistura kottelati differs from the other species of genus Schistura known from Vietnam and adjacent areas in Laos by the unique combination of the following characters: lateral line very short, with 5–14 pores; pelvic fin with 1 unbranched and 8 branched rays; a long maxillary barbel (reaching vertical through nape) and inner rostral barbel (reaching vertical through anterior margin of eye); body without obvious markings; caudal fin deeply forked (length of median ray 1.5–1.7 times in length of upper slobe); no external sexual dimorphism; caudal peduncle slender (its length 8.0–11.6% SL); a large eye (eye diameter 4.7–6.2% SL); and wide interorbital region (interorbital width 9.1–11.7% SL). Etymology. The species is named for Maurice Kottelat, in appreciation for his research on Eurasian freshwater fishes, among others those of Vietnam. A noun in genitive. Ho Anh Tuan, Hoang Ngoc Thao and Ngo Xuan Quang. 2018. Schistura kottelati, A New Species of Loach from the Phong Nha-Kẻ Bàng National Park in central Vietnam (Teleostei: Nemacheilidae). RAFFLES BULLETIN OF ZOOLOGY. 66; 142–148.